This is my third post in response to the Weekly Photo Challenge – Pattern. This is also Part III of my post – the Terracotta Warriors. If you have not seen my video, I highly recommend you to take a look. I am re-posting the video here since many of you have missed it. The patterns on these artifacts are very impressive. They demonstrate the advanced technology already used in China 2,700 years ago. I found some interesting information from the Asian Art Museum docent website and would like to share with you here. “石甲 Suit of armor Qin dynasty (221–206 BCE) Limestone Shaanxi Provincial Institute of Archaeology Catalog #91 in China’s Terracotta Warriors: The First Emperor’s Legacy H. 77 cm (30 5/16 in), W. 50 cm (19 11/16 in) This suit of armor, one of probably thousands still being found, consists of more than six hundred stone pieces laced with copper wire. 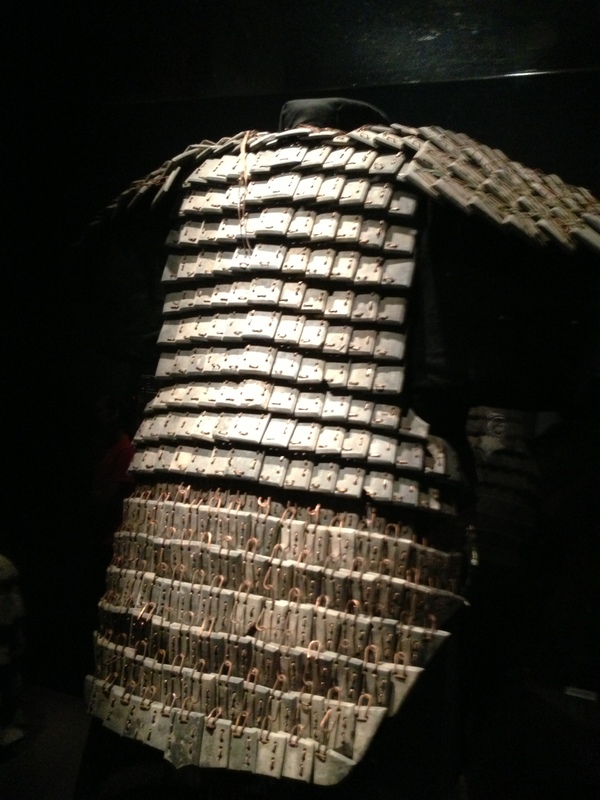 Stone armor was too heavy to wear into battle, and was made instead for burial. Combat armor was made of leather or metal. This limestone armor and the helmet are constructed from fragments found in 1998 and 1999, in a pit thought to be the armory and located not far from the First Emperor’s tomb mound. The pit is estimated to cover 13,000 square meters. Excavation is ongoing, with more than 130 stone armor suits discovered to date. Only one-eightieth of the pit has been excavated. 鳳鳥紋瓦當 Roof tile end with phoenix motif Warring States period (475–221 BCE) Low-fired ceramic Shaanxi Provincial Institute of Archaeology Catalog #61 in China’s Terracotta Warriors: The First Emperor’s Legacy Diam. 15 cm (5 7/8 in) Many roof tiles that include a phoenix reflect religious beliefs. Qin people believed that their primary ancestor was the “heavenly bird,” a reference to the phoenix. The bird represents a deity, corresponding to yang energy and the cardinal direction of the South. Phoenix roof tiles probably emerged in the early Qin period. According to ancient documents, a duke who died in 621 BCE built a Phoenix Tower for his daughter, who played the flute there for decades in dedication to “heavenly birds.” In return, it is said that the phoenix accompanied her as she ascended to heaven. All the above description are quoted from the the Asian Art Museum docent website. Do you like the patterns on these artifacts? I do. Remember they were made 2,700 plus years ago! Isn’t it interesting that the Dragon Emperor, like the Pharaohs of Egypt had one thing in common. They were focused on their afterlife situation. And because of their concern for immortality, we have the most remarkable legacy in the form of artistic endeavors. This is an excellent post. I have comes back to it several times. These terra-cotta warriors almost look ready to spring to life. Thanks so much, Rebecca. I am glad that you like these warriors as much as those in Vancouver. I do intend to write about all these 10 warriors in my next few posts. I just have to set priorities and meet other demands. Since these two weeks are the closing weeks, I am taking many colleagues and friends to the museum (at lunch time) because I love to share what I like. We have learned so much not only about the First Emperor but about the way that people lived 2,700 years ago! BTW, I have my own you Tube channel now. Please take a look and see if you have missed any of my videos. I have posted most of them on my blogs.